Disklok is the strongest and most effective full cover steering wheel security lock in the world for cars and light commercial vehicles. For vehicle security, the unique award winning Disklok has a long and proven history of outstanding performance, tried and tested against would-be car thieves and professional security testers. The reinforced all steel construction makes the Disklok an extreme deterrent with its high visibility and reputation for durability, outlasting the attack times of all other steering wheel locks on the market today. The unique advantage it has over the competitors is its ability to spin on the wheel when attacked, preventing steering and damage to the vehicles own steering wheel lock. 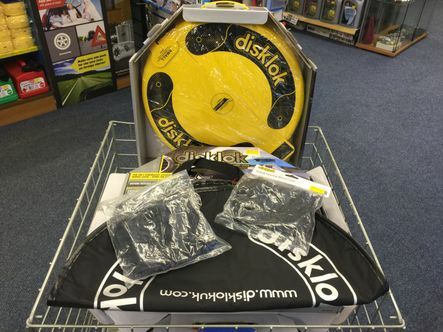 We have size small instock yellow and silver which fits 90% of vehicles including Range Rover Evoque, Also you can buy a Disklok cover and steering wheel protector. This may make a good gift for someone you no who loves there car and wants to prevent it from going missing.